Skype for business saw its official stable launch in 2017 and its features are designed to target businesses specifically. The program which will soon go under the name Microsoft Teams has taken the enterprise by storm. As one of the leading communication specialists we can offer you Skype room systems to enable large scale meetings. Bringing together Skype for Business desktop users with Surface Hub in a Skype meeting is the future. Employees are now able to meet with anyone, internally or externally. Interoperability can be achieved while retaining the native call experience for users on different platforms. A lot of our clients have also been asked to give evidence via Skype. 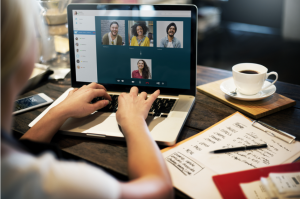 For use in courts, Skype is not reliable enough (the connection is not stable enough and it is not a secure line) so we can offer you an alternative laptop link solution called Jabber. The program works on a similar principle, but it creates a secure connection which we then link into the courtroom. We connect the witness from their own personal device (this can be a laptop, tablet or even a smartphone). All that is required is a stable internet connection and a device with a working camera and microphone. The laptop link is a frequently used service with the UK courts, as it is easy to set up and causes minimal disruption, as well as being a very cost effective solution. For more information please visit our website and have a look at our judicial services.